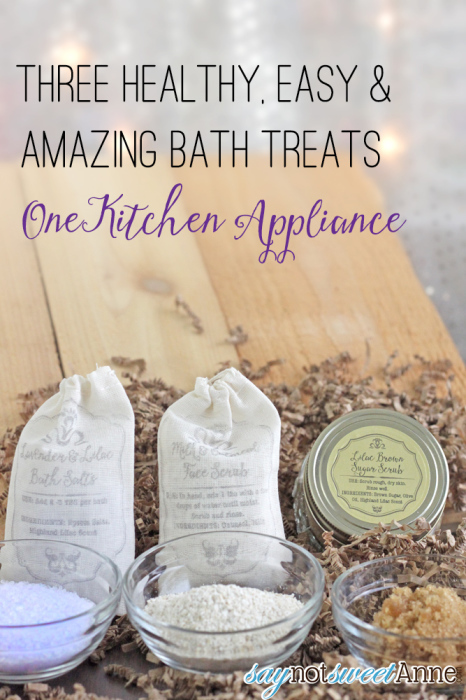 I’ve mentioned a few times recently that bathing is my new favorite pamper-me activity. Maybe its all the threats of “wait until that baby is born! You’ll never shower again!” Maybe its the aches and pains of pregnancy. Either way, a relaxing bath is my favorite way to unwind after a long day. 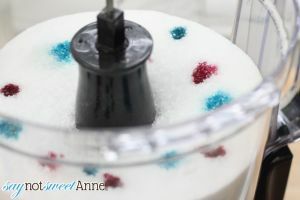 So, when Hamilton Beach approached me about doing a holiday craft with their new Stack and Snap™ 10 Cup Food Processor, I was all over it. These beautiful treats are going to be the centerpiece of a wonderful gift this season! I made all three of these amazing treat-yo-self (Parks and Rec fans out there?) products in one day. Truth be told, they took me hardly any time at all, and are more than pretty enough to give as gifts! Each of these recipes is made in a food processor. 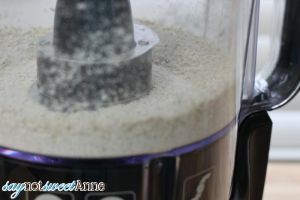 I used a Hamilton Beach Stack and Snap™ 10 Cup model, but any good, high powered food processor will do. Be sure to clean thoroughly and dry between recipes. (No measurements because it really doesn’t matter. As much or as little as you want). The general rule of thumb for all of these recipes is: blend until blended. I know it sounds super simple, but thats what it is! 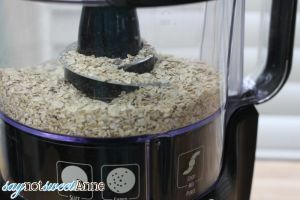 Combine the oats and milk powder in the food processor until they make a fine powder. If desired, add a few (5 or 6) drops of Rose Hip Seed Oil through the chute while the processor is running. 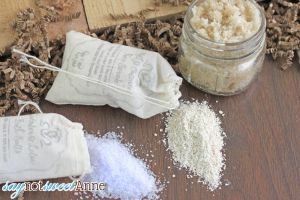 To use, mix about a tablespoon of the mixture with a few drops of hot water until it becomes slippery. 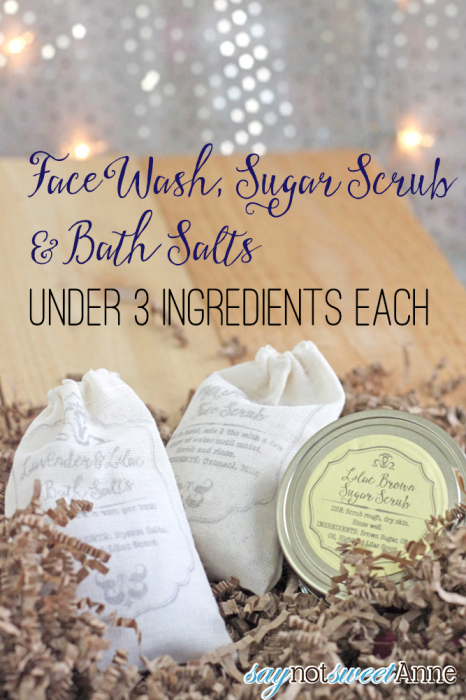 Use it like any face scrub and then rinse thoroughly! 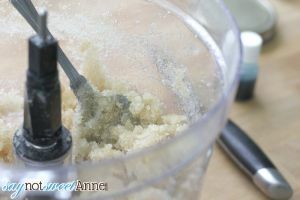 Combine all ingredients in the processor until they are moist and homogenous in color. If desired you can add 2 drops of a favorite essential oil, some vanilla extract, or even spices like cinnamon. 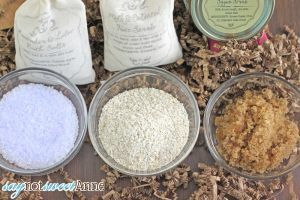 To use, grab a small scoop of scrub and use it to exfoliate dry skin on the hands, feet and elbows. Rinse thoroughly! 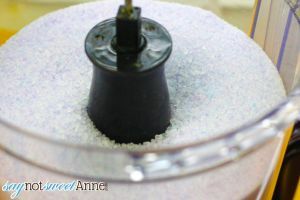 To use, add 1/4 cup to a hot bath! Funny you should ask Jo! This is the method I used for transferring. And there are a few fonts in use, the swirly one is Stringfellows, a paid font.